Discover the region of the Barbanza, a land of strong contrasts, where the Oscar-winning film “The sea inside" was shot. On this excursion from Santiago de Compostela you will enjoy a full day tour discovering Low Estuaries and The Landscapes of "Mar Adentro". A BARBANZA is a peninsula which harmonize with the hilly landscapes and the skylines of the estuaries and open coasts. Prehistoric memories, "savoir vivre" in free time combined with a busy fishing activity. The whole BARBANZA is a combination of marvellous landscapes which can be admires by following our itinerary. A CUROTA VIEWPOINT: The mountain of A Curota (596 metres) is located at the southern end of the O Barbanza range, a granite formation that forms the backbone of the peninsula, separating the Muros and Noia estuary (to the north west) from the Arousa estuary (to the south east). PADRÓN: A medieval town with a very important jacobean tradition lying between the rivers Sar and Ulla. Land of poets like Rosalía de Castro, Macías, Rodrigo de Padrón, Camilo José Cela. PUEBLA DE CARAMIÑAL: A quaint villa, composed of two parts; "Puebla del Deán", quarter of nobility and former places, and "Santa Maria del Caramiñal", marine district where the salting industry grew up. DOLMEN DE AXEITOS: One of a large number of dolmens in Galicia, which remember a former style of live. 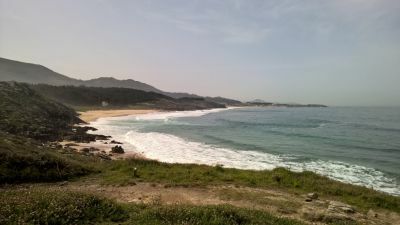 CASTRO DE BAROÑA: Facing to a magnificent and tidal wave beach. It was excavated and opened for tourists, who admires the art and history of the Celts. CASTRO DE BAROÑA faced to a magnificent and tidal wave beach. It was excavated and opened for tourists, who admires the art and living of the celtics. CORRUBEDO views over the probably most beautiful dune of Galicia and visit to the lighthouse. DOLMEN DE AXEITOS is one of a large number of dolmens in Galicia, which remember a former style of live. MONTE CUROTA 861 m high. It´s the top of the Barbanza mountains; sanctuary of the nature. From the Natural balcony " Valle Inclan" of national importance at 498m we can get a most impressive view to the Arosa Estuary among wild horses. PUEBLA DE CARAMIÑAL (stop) a quaint villa, composed of two parts; "Puebla del Deán", quarter of nobility and former places, and "Santa Maria del Caramiñal", marine district where the salting industry grew up. Time for lunch on your own during the day. We can recommend or book a table for your lunch if you like. PADRÓN (stop) medieval town with a very important jacobean tradition lying between the rivers Sar and Ulla. Land of poets like Rosalía de Castro, Macías, Rodrigo de Padrón, Camilo José Cela. Tip and Gratuities to guide. Transfers not specified in the itinerary. Entrance fees not specified in the itinerary. Beverages not specified in selected meals. Meals not specified in itinerary.